private jet and heading to St Moritz where you’ll whizz down the slopes on skis made of money? Ok, perhaps the notion of bathrobes and skis made of money is taking things a little too far, but we’re in the realm of dreams so let’s say, anything goes. If you’re an avid gamer and you like to spend your time playing at a casino online, you’re likely to be fuelled by a big dream. Perhaps the spinning reels of a slot game set your heart aflutter, or maybe you’re drawn to the intense excitement of a live blackjack table or the clunky sounds of a ball jumping its way into a pocket on the roulette wheel. Any online casino Canada has to offer will give you the chance to experience all the thrill and tension of placing a bet on a casino game. And whatever your game is, you’re there to make a killing, just like they do in the movies. Hollywood is no stranger to the idea that ‘anything goes’ and over the years, movie moguls have filled the silver screen with legendary casino wins that tap into our wildest dreams and have us believe that anything is possible. Tales of gambling involving the underdog taking on the casino, just like David took on Goliath, have long been spun in grandiose Hollywood style. Films such as Oceans 11, Rain Man and 21 have all shown that it’s possible to beat the casino at its own game –albeit by cheating your way to the top. In fact, it’s almost impossible to find a movie where a big win is actually legit. Even in a movie as thrilling as Casino Royale, where James Bond goes head to head with Le Chiffre in a game of poker and subsequently wins a fortune, you’ll notice that the win is not all it’s cracked up to be. First of all, both Bond and Le Chiffre are holding practically unbeatable hands and yet continued to play as though there was a great need for strategy and bluff. In a real poker game, both players would have gone all in at the get-go because a killer hand doesn’t come around that often and so when it does you don’t hold back. Also, Le Chiffre has an extremely noticeable ‘tell’, and any professional poker player would tell you that in a real poker game it’s highly unlikely that an opponent’s ‘tell’ would be so significant as to give the game away. 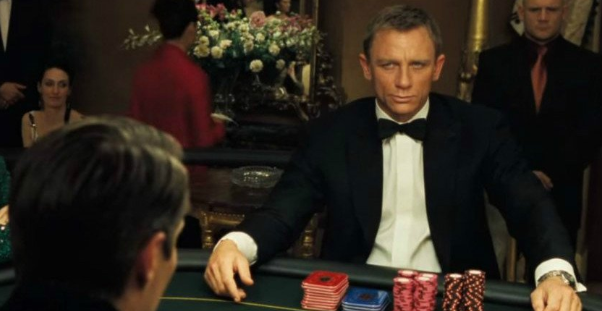 Unfortunately, if Bond has inspired you to try your luck at poker, you might not find it quite so easy to win! However, if you are in the market for some tips and tricks, sites like new-casino.ca are a great tool to take advantage of! Both Rain Man and 21 are films that teach you how to win at the casino with the notorious method of card counting. You may think that this is a sure fire way to win at blackjack, but it would be a mistake to discount the fact that the card counters in both movies are extraordinary mathematicians. Raymond, or rain man, is a genius savant who makes card counting look easy, and the team in 21 are top MIT students with off-the-charts math skills. For those of us who don’t possess these seemingly magical abilities with numbers, card counting is probably not going to help us win a fortune. And don’t forget, card counting is cheating and a sure-fire way to get you banned from a casino for life and possibly sent to jail.